1. 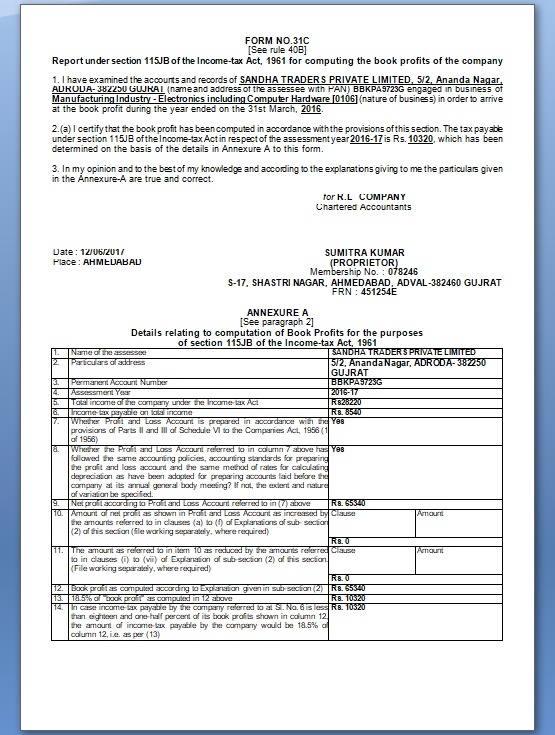 I have examined the accounts and records of SANDHA TRADERS PRIVATE LIMITED, 5/2, Ananda Nagar, ADRODA- 382250 GUJRAT (name and address of the assessee with PAN) BBKPA9723G engaged in business of Manufacturing Industry - Electronics including Computer Hardware  (nature of business) in order to arrive at the book profit during the year ended on the 31st March, 2016. 2. (a) I certify that the book profit has been computed in accordance with the provisions of this section. The tax payable under section 115JB of the Income-tax Act in respect of the assessment year 2016-17 is Rs. 10640, which has been determined on the basis of the details in Annexure A to this form. 3. In my opinion and to the best of my knowledge and according to the explanations giving to me the particulars given in the Annexure-A are true and correct. Whether the Profit and Loss Account referred to in column 7 above has followed the same accounting policies, accounting standards for preparing the profit and loss account and the same method of rates for calculating depreciation as have been adopted for preparing accounts laid before the company at its annual general body meeting? If not, the extent and nature of variation be specified.